A research group looking into the puzzling distribution of Alpine Long-eared Bat (Plecotus macrobullaris) have found answers by analyzing five other vertebrates that have a similar geographical distribution. Since first being discovered in the Austrian Alps in 2003, the only high mountain bat species in Europe has often mysteriously been found close to sea level in Croatia, Greece and Crete. Looking into why this species, thought to be restricted to mountain environments, can appear at sea level at the same time, researchers from the UPV/EHU’s Behavioural Ecology and Evolution Research Group analysed the distributions of 503 other vertebrates. Of those, they found five; the white-winged snowfinch, the Alpine chough or yellow-billed chough, the wallcreeper, the Alpine accentor and the European snow vole, that have similar geographical distributions to that of the bat. In order to work out why they were following a common distribution model, the researchers compared the species ecological features to see whether they were all following a common biogeographical pattern. As a result, they determined that the species are not in mountainous areas due to the cool climates, but instead because of the rugged rocky terrain and the large open spaces. In the cases of Croatia, Greece and Crete, these conditions can be found at lower altitudes, and that explains why the species can be found at sea level. 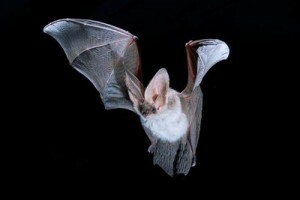 However, this is not to say that climate does not have any influence on the bats as researchers found that the climate determines the altitude ranges that each species can live in.